Today we remember the fighters. They are you and they are me. They are the Anzacs who fought with great courage, resolve and commitment. On 25th April 1915, 16,000 troops surged ashore at the foot of rugged cliffs on the Turkish peninsula, intending to give allied forces shipping access to the Black Sea, bring help to Russia, and ultimately capture Istanbul. An eight-month-long campaign ensued. From a population of less than five million people, 61,513 Australians were killed in the First World War, and 152,000 more were wounded (http://www.awm.gov.au). That represented over 1%, or 1 in 100 people, wiped out. What a valiant group of men and women who fought for freedom and, without doubt or hesitation, for the nobility of their cause. Giving thanks for their sacrifice, we honour our Anzacs and those who have given of themselves in war and peace keeping efforts. Not only do we remember them, but we endeavour to live our lives in a manner worthy of their sacrifice. As I think of my readers, I know that many of you are fighting your own battles, battles not unlike the Anzac soldier. It may not be a battle you have created, yet it is a battle you must dig deep to keep fighting for a better tomorrow. Today, be inspired by the courage, resolve, and commitment that those Anzac soldiers embodied. The Anzac spirit teaches us to resist apathy and care about life and living. It teaches us commitment to the freedom we seek. The Anzacs were relentless to make this world a better place. Faith, bravery, and love do not only look for the best, they make things better. What is your battle? Are you fighting for your marriage, children, health, finances, job? Are you fighting anger, depression, anxiety, or loneliness? Your battle is worth the fighting. Your fight makes a difference. You are not alone. Not even the Anzacs went it alone. 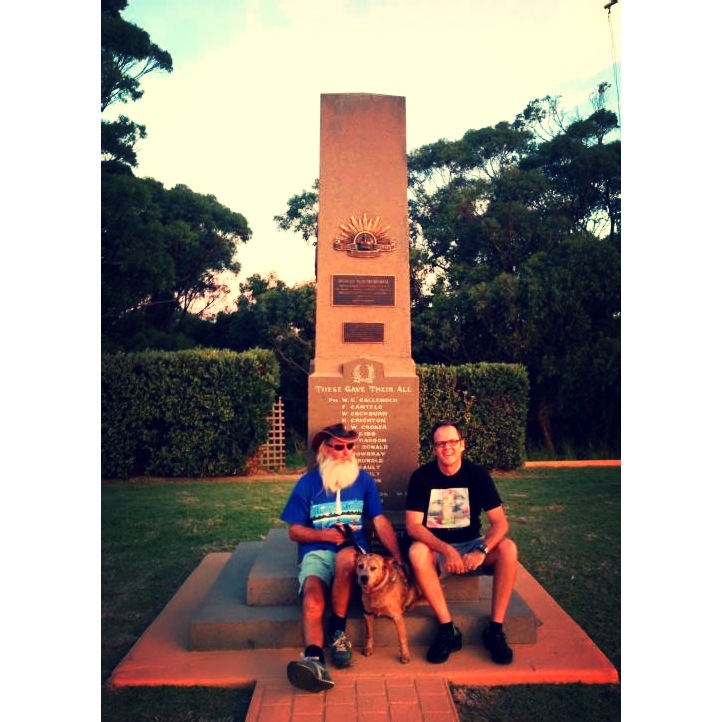 The Anzacs relied on each other for life and death, it was a powerful mateship in the face of tough times. We need each other, we need mates who have each others’ backs. Greater still, the beauty of a relationship with God is that He promises to be “a very present help in time of trouble” (Psalm 46:1). Maybe today your first act of courage is to go to God as your helper. I can’t imagine battling my current health challenge without His very present help. God is the one who goes with you and will not leave you. Even though you walk through a dark valley, fear no evil, He is with you. God is for you, not against you. You can trust God. He is your defense and your salvation. God will strengthen you, help you, and uphold you by His right hand. God will not fail you. The Bible tells us that love is from God. Love is the primary characteristic of God. More than that, God is love. 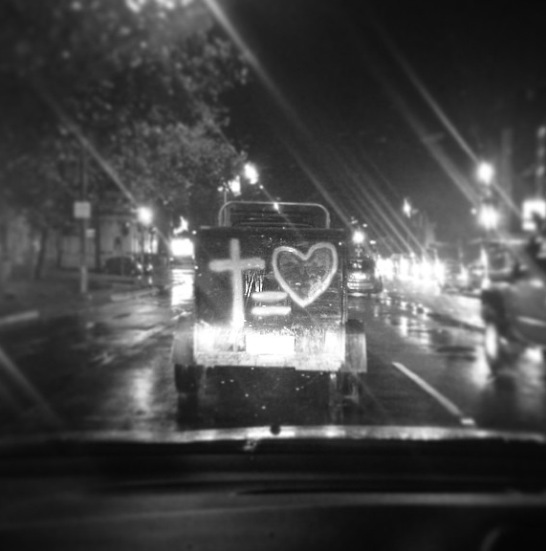 God’s love is a non-discriminating, sacrificial, unconditional love. John 3:16 says, For God so loved the world (everyone) that he gave his one and only Son (Jesus), that whoever (that’s you and I) believes in him shall not perish but have eternal life (life now and even if we die). What does this mean? It means that God sent Jesus, His only Son, to die for you and I, so that when it comes time for us to face our own death, we have an answer in the Saviour, Jesus. It’s the greatest love story ever told. Everything that Jesus endured was all for you and it was all for me. Love was the reason, the motivation, and it’s the answer to it all. If something is only as valuable as how much someone will pay for it, consider this: Jesus gave all He had for us. Whatever the highest height or the lowest low we experience, our value as a human being is not found in what we do, our position in life, or the challenges we face, but it is found in His love for us. Jesus died for you and I before we ever knew Him, before we called Him friend. He loved us in our sin, through our sin, and exchanged our sin for His life. Because we are created in His likeness, God made us with the capacity for love, both to give and receive it. Why this couldn’t wait until tomorrow is because I want to encourage some of my readers who are going through some really difficult times. Some who are literally facing the reality of their own transition from this world to the next. Today, I encourage you to find time this Easter to consider Jesus as your answer to death and its sting, its power, its fear. It’s only as we have dealt with the reality of our own frailty and impending death that we can freely live and live freely. And for the record, 10 out of every 10 people in this world will die! The question is not “when will I die?” or “will I die?” but “what will be my new address when I die?” I have chosen life, heaven, and eternity in God’s presence. I have chosen Jesus to be my Saviour. If you’re in Newcastle, Australia and you don’t have a church to call home, I invite you to join me tomorrow at Hillsong Newcastle, 10am, 669 Hunter Street. For everyone else, why not find a church this weekend and consider the love that Jesus has and its relevance to you. Please share this with your friends, let’s together get the message of love out there this Easter! Your challenge could be your chance. If that’s to be the case, you must decide how you are going to face life challenges. The reason I believe many of us don’t see the chance, possibility or testimony in the midst of challenges is because we do not expect challenges to happen and when they do, we are rocked, surprised and even confused. Instead, embrace the reality of challenge – it is part of life’s experience. A kind person will encounter meanness. A healthy body will need care. A strong marriage will face struggles. There will be bad in the good days and good in the bad days. How can we face and overcome life challenges? Firstly, don’t be in denial, avoiding the proverbial “elephant in the room,” acting as if a challenge does not exist. Instead, actively move to face and deal with challenges, just like God did. Ever since the Garden of Eden, Eve’s apple and Adam’s sin of silence, the world has been different to its initial intent. I would say this represented a huge challenge. But, what do we see God doing? God immediately faced the problem. God stepped into the situation, seeking out Adam and Eve, He dealt with the problem, and came up with a redemptive solution. God did not wait for the problem to resolve itself. In the same way, we need to be proactive about facing and solving challenges. Secondly, this means that we bring truth to our challenges and we take ownership of them. Shifting blame does not help solve problems. Mature people are not as concerned about who is at fault as they are about solving the problem. Even if they didn’t cause the mess, they will take ownership of the result and get busy to fix it. God did not cause the fall of the earth. But, He put his arms around the problem and sent a Saviour. A parent with a child who is not doing well at school will not just blame the teacher or the school. He or she will care about the problem and take ownership of it to help solve it. Do you have a challenge today? The easy way around it is to pretend it doesn’t exist or blame someone else for it. But how I see it, there are two options: easy first, hard later, or hard first, easy later. God’s way is to face the problem now, and thrive in the end. 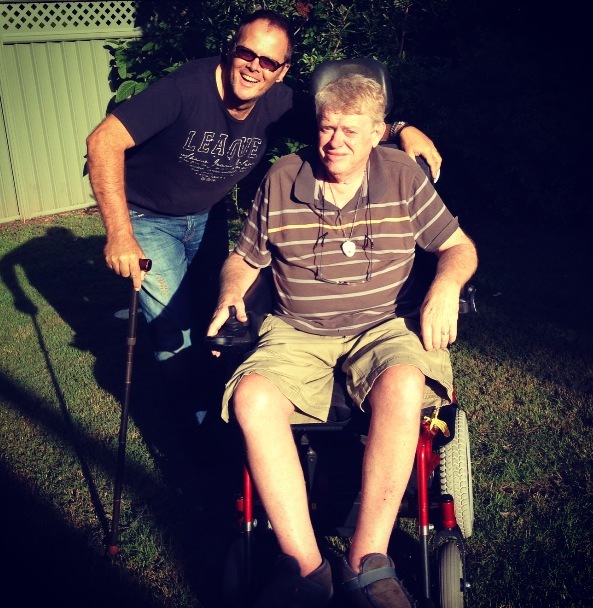 This is Malcolm, a former University Lecturer, Geologist and Volcanist, now battling MND. If you get a chance today, please join me in praying for him. Once you fall in love with Africa, there is no turning back. I am homeward bound after a whirlwind trip, Friday to Friday, 7 days which has left me changed, again. This was to be my last visit to the Congo after travelling there for the past 7 years speaking to Churches, government sectors, business people and universities. There is no denying that my heart has knit with the Congolese and with this diverse place. With the possibility of not coming back here and maybe because of my heart connection with this place, I was uber-conscious of taking it all in, giving as much as I could and not leaving any opportunity unturned. After arriving in Kinshasa, the capital of DR Congo, I was struck with how different things have become since my very first visit 7 years ago. Airport arrivals was relatively calm and there were no grabs for bribes. The road from the airport was no longer littered with old trucks and cars, in their place, an eight lane highway. And for the first time, I saw street sweepers late at night cleaning up rubbish from the roads. This may not seem like much but these changes spoke volumes to me. You see, I believe that when we begin to take responsibility for the small things, it creates a culture of valuing all that matters in life. Isn’t that why we start small by teaching our children to say thank you and please? I was equally impressed by the schools that have been established. One was started 14 years ago by a Sunday school teacher and is now the most sought after primary school in the city. Other young women are being inspired by this lady’s innovative spirit to bring about real change. There is a sign that hangs over Nelson Mandela Square (where I am writing this blog) and it says, “It always seems impossible until it’s done“. The Congolese people are putting impossible to rest. Another friend is opening a palliative care facility, touching me deeply by naming it “The Phil Camden Palliative Care Centre”. I don’t think he realises what an inspiration he is to me by the incredible fact he has succeeded in the face of real opposition. People who live with passion, courage and vision to see a better future, despite their present reality, never cease to amaze me. One such person I had the tremendous privilege to catch up with was Joost van der Westhuizen, South African champion Springbock Rugby player, now living with MND / ALS and working tirelessly for the benefit of other sufferers through the J9 Foundation. South Africa has no assistance or association to care for MND patients. In fact the only drug available for MND patients is a drug called Rilutek (said to increase life by 3-6 mths) and it is 10 times more expensive in South Africa than in Australia. The J9 foundation is very much at the pioneering end of making this a better world for MND patients and carers at considerable personal sacrifice. By far, the hardest part of this trip was saying goodbye to friends I may not see for a while. I have loved investing into the people of the Congo and starting to see many of them step into all God has for them. Just when I thought it was all over, I don’t think I’m finished with Africa. The people, the place, the potential moves me beyond looking at my human frailties and physical restraints. Plus, I think J9 Foundation could do with a few more friends. Wherever you are reading this today, I wonder if there is something you have never done before, something that seems impossible but you know you should do it? Take courage from my ponderings today, turn impossible around! 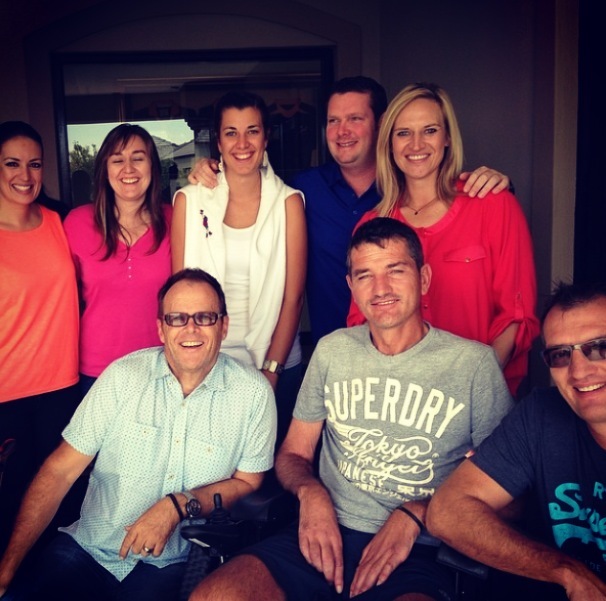 An inspiring team, Joost van der Westhuizen & the J9 Foundation, South Africa.